Admit it, when was the last time you visited the zoo? 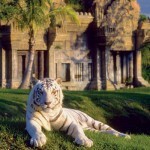 Miami’s MetroZoo is a world leader in the “cageless zoo” concept. The magnificent white Bengal tiger will start your adventure off right. One of the nation’s top zoos right in your own backyard. And the weather is just perfect for walking around. Over 700 acres, more than 2,000 animals representing over 400 species and easily accessible via the Florida Turnpike. This often overlooked jewel in South Dade is not to be missed. If you even think you may want to return before a year is up, get the annual membership. You can revisit all year for free as well as visit affiliated zoos throughout the country and get discounts on food and gift shops. I highly recommend the membership route. A young family with kids can keep their kids highly entertained for very little moola all year. Special rates online! This entry was posted on Thursday, March 11th, 2010 at 6:35 pm	and is filed under 365 Things To Do In Miami. You can follow any responses to this entry through the RSS 2.0 feed. Both comments and pings are currently closed.